Also known as "Angel Stone" as it is believed to help in communication with Angels or Animal Spirit guides. 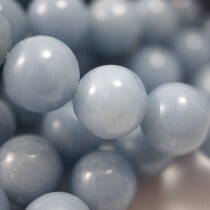 Angelite is actually a trade name for an opaque grey/blue form of the mineral Anhydrite - named from the Greek “anhydros” meaning “without water” in reference to the lack of water in its composition. Believed to enhance telepathic communications. To allow one to speak the truth and to be more compassionate and accepting of things which cannot be changed. 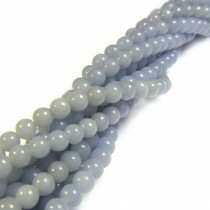 Angelite Round 4mm Gemstone Beads (~100pce Strand) ~40cm/16'" Strand. 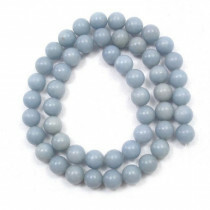 Angelite Round 6mm Gemstone Beads (66pce Strand) - 40cm/16'" Strand. 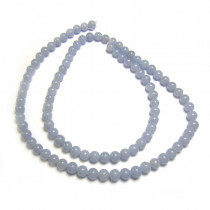 Angelite Round 8mm Gemstone Beads (~50pce Strand) - 40cm/16'" Strand. 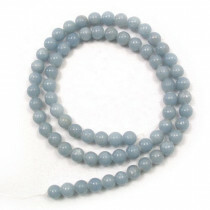 Angelite Round 10mm Gemstone Beads (~40pce Strand) - 40cm/16'" Strand.